Creating a jewelry making studio that will serve you well for both function and inspiration takes some care in planning. First, consider what materials you will be working with before deciding what kind of work table or tables you will need. If you will be working with heavier equipment such as a drill press, a rolling mill or a table top kiln you will need a good sturdy table. A table with a solid top and strong legs will also be necessary for sawing metal sheets, forming, hammer work and techniques requiring a vice grip. A jewelers work bench can run anywhere between $200 to $700. Traditional work benches come with aluminum lined drawers that can be used as work surfaces, tool drawers, arm rests, mandrel holes and a recessed area with a steel work plate. I love my work bench as it has two working surfaces and the lower one glides out over my lap so that I can sit close to my work. The upright back panel is made out of peg board which makes it great for organizing tools and there is an upper and two lower areas for extra storage. I purchased my work bench on sale for about $60 from a building supply store. It is not only a practical alternative to a jewelers bench, it is also very economical and offers great functionality. Here is a photo of the work bench. 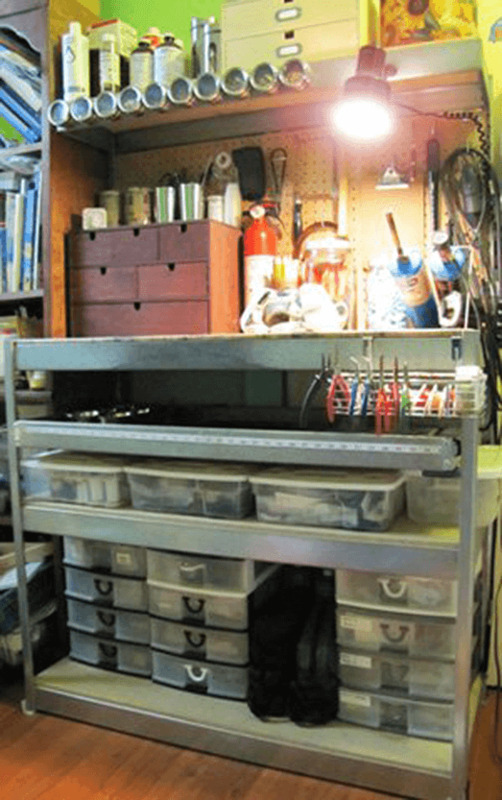 For ideas on how to organize your work bench click on the photo. Your jewelry making studio is your space to create. It not only should serve you for easy access to supplies and offer great functionality, it also should be a place where you feel inspired to create! Consider making that space uniquely yours with some inspirational photos and by introducing storage containers that reflect your personality. By injecting colors that you love and some unique furnishings you can have both form and function in a way that says YOU. 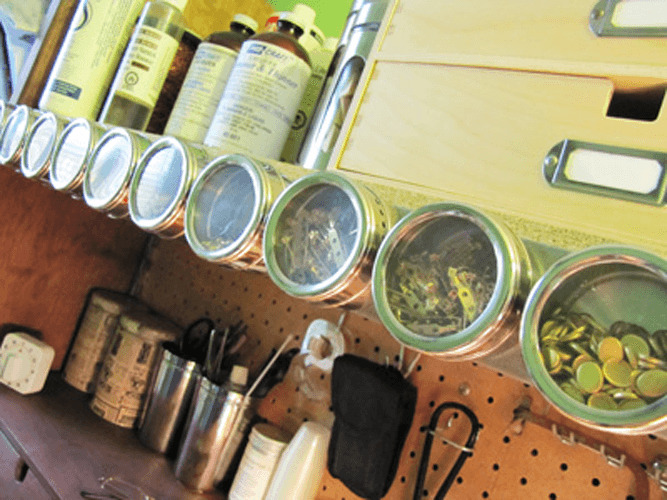 Since I have a love for old world design I have included storage containers that have an old apothecary feel. I purchased several units with mini drawers many years ago and to this day they serve both my business and my personality. They are great for organizing supplies and I love to look at them. I now have so many drawer units that I can organize all of my supplies into them and one day I will get around to finishing all of them in a dark, rich brown with old fashioned labels. For ideas on how to organize your jewelry supplies click on the photo below. When planning your working area you must always consider safety. You will need to take all the the precautions to ensure not only your safety, but the safety of those you love and of your special home. To learn more about safety click on studio safety. When you have the desire to create it is very exciting to plan a space where you will enjoy the process. It is not just about a table and chair and a few tools. It is about you! It is about your unique jewelry making studio space.